One of the sleekest-looking dolphins is also one of the most elusive. It inhabits far-southern waters, where there are few people around to enjoy its beauty. Because of that, it faces fewer threats from fishing fleets and other hazards. 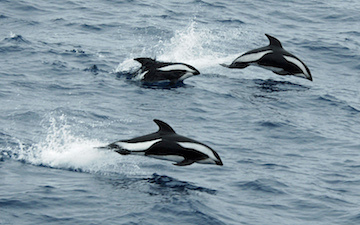 The hourglass dolphin is named for its unique coloring. Its body is black with a pair of white stripes down its sides. The pattern creates the look of an hourglass. The hourglass is one of the smaller species of dolphin. It tops out at about six feet and less than 250 pounds. It lives in the cold waters south of Africa, Australia, and South America, down to Antarctica. Because of that range, not much is known about the dolphin’s habits. Biologists have studied only a handful of them, and they don’t see them in the wild all that often. They do know that the dolphins typically travel in small groups. They’re occasionally seen in larger groups, and they often hang out with whales. They feed on fish and squid, near the surface. That attracts flocks of birds, which is one way that biologists find them. The last population estimate said there were more than 140,000 of them. But that estimate was made more than two decades ago, so no one is sure what the number is today. Their remote location saves the hourglass dolphin from most human threats. It’s seldom caught in fishing nets, and it’s so far from shore that it doesn’t have to worry about pollution or loss of habitat. So this beautiful but elusive dolphin should continue to thrive for a long time.